It’s a beautiful day for a white wedding! Well, the Masters-White wedding that is! We have been so excited to share with you this wedding. 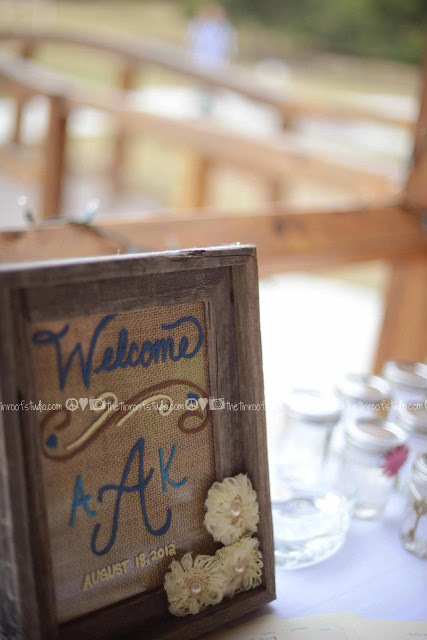 Besides the fact that we absolutely loved the rustic-chic vibe and the colors they chose, they also had a bunch of details that made it really special. Their attention to the “little things” really made this an event to remember. 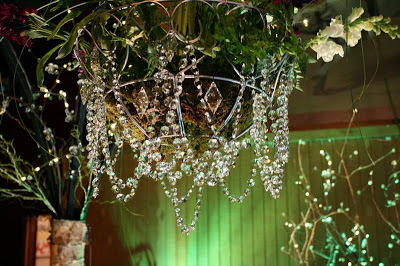 Russ Lawrence made their vision come to life with his beautiful florals and decor. We tell ya – that man is a genius! Thanks Mindi! It was our pleasure! We loved the use of bunting! It really enhanced the building. Isn’t it beautiful? So simple, yet it makes such an impact! 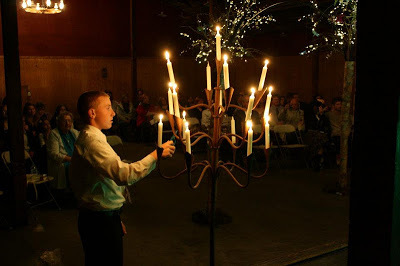 The set-up for their first communion was perfect! Gotta love chalkboards! They are the perfect touch to any rustic-chic event. This was a smart idea too! By asking everyone to leave their address, they will have the current ones on hand for thank you notes. 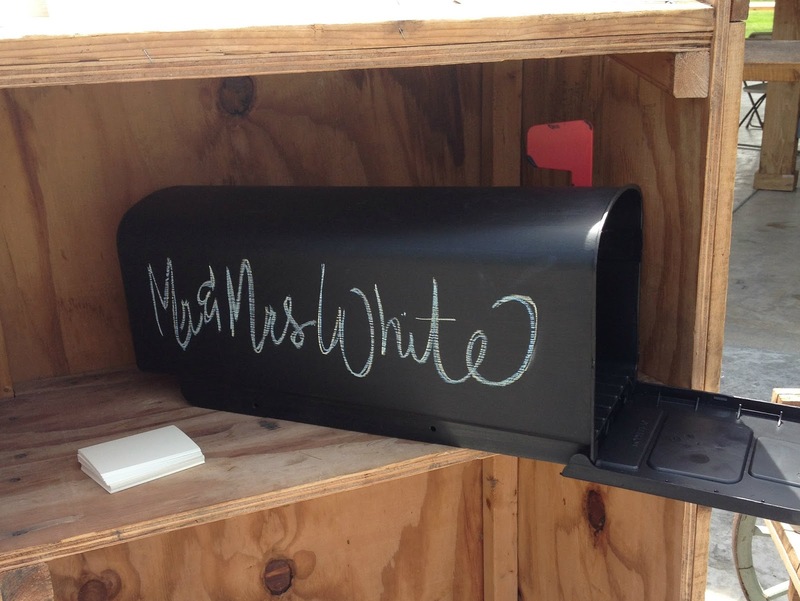 Guests left their address in Mr. and Mrs. White’s mailbox. Can they get any cuter? 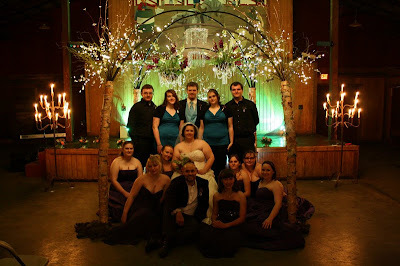 The wedding party looked amazing! We loved the dresses and casual suits (sans coat). 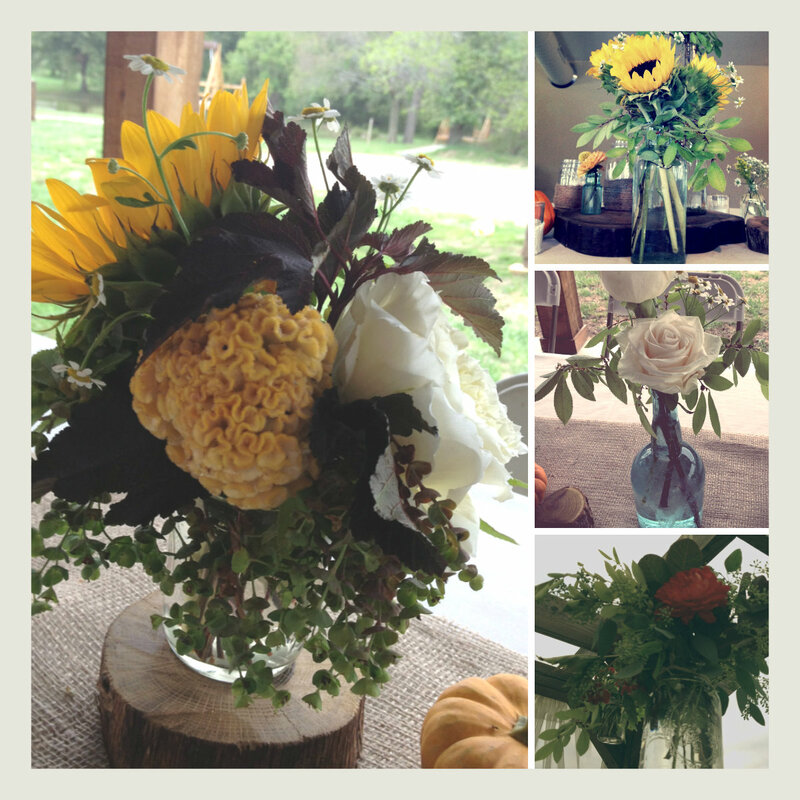 A simple sunflower helped tie it all together. We were especially digging the groomsmen’s shoes! Casual, yet classy! Comfortable too! Comfortable enough in fact that they could enjoy the zip line before the ceremony. Crazy guys! 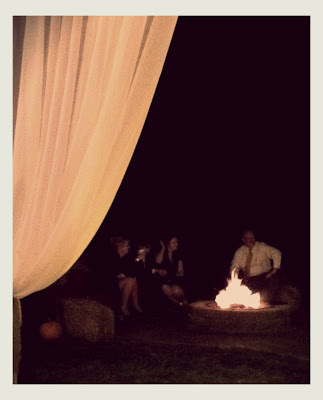 Speaking of the ceremony – it was BEAUTIFUL! We love how the draping created a clean, elegant altar. 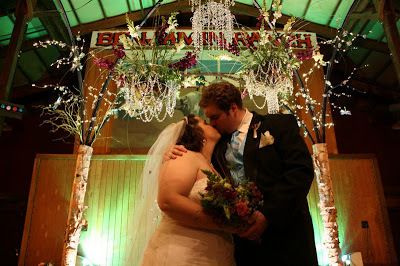 The lanterns on the pavilion ceiling (such a cool idea) were such a neat touch. 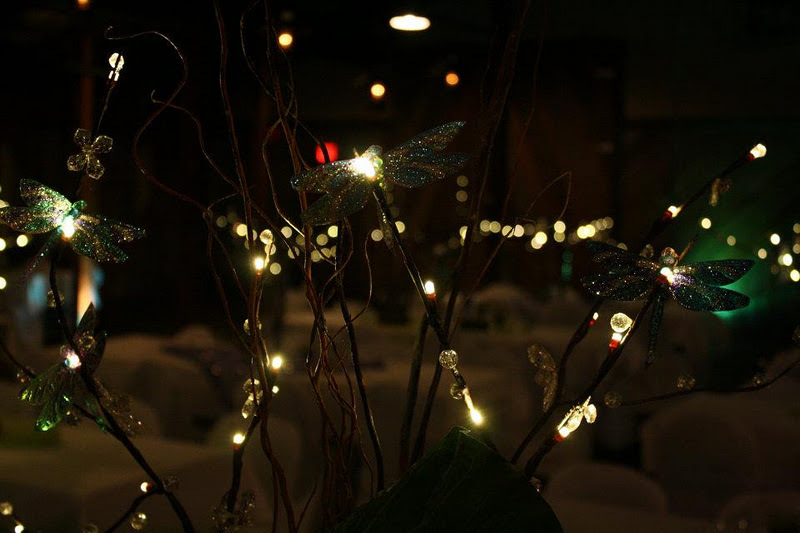 They looked beautiful all lit up at night too! Okay, can we talk about this cupCAKE though! It’s like yellow and white tiered heaven! Beautiful AND delicious! The grooms cake was awesome too! It added a really sweet personal touch. 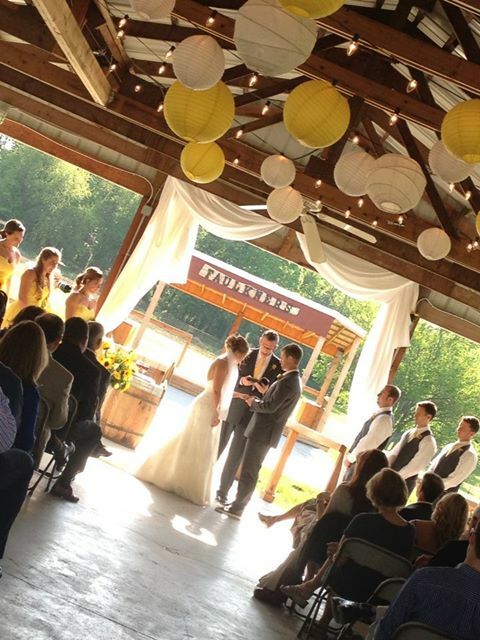 For any future Faulkner’s Ranch brides, yellow is a really good color to choose as one of your accent colors. It just fits beautifully into the ranch setting. That’s why we loved the pops of yellow in the florals. They were so bright and fun! 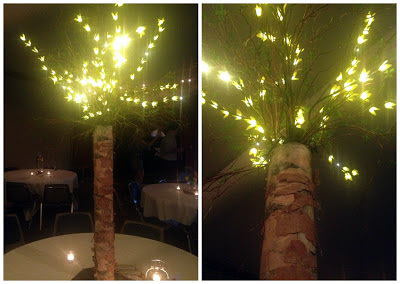 In addition to the stunning florals, some of the tables had these neat lit up trees. They really added to the ambiance of the night. Guests didn’t go home empty handed. 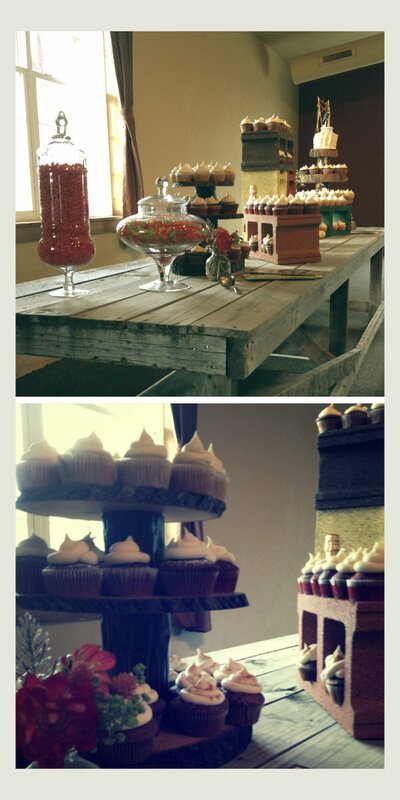 Nothing like some sweet treats to thank your guests for celebrating with you! Congrats once again to the happy couple!!! 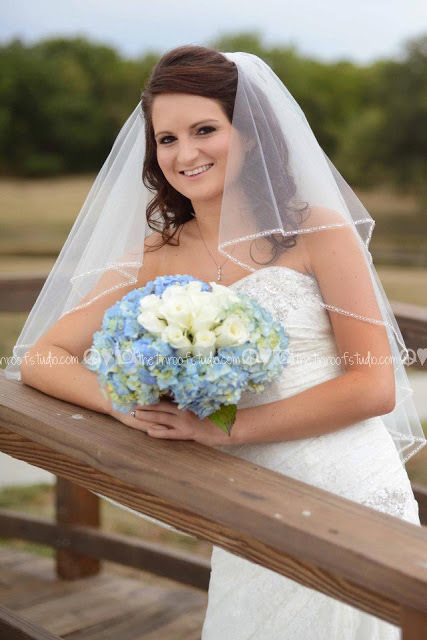 We felt so honored to be able to celebrate your big day with you! Are you interested in having your wedding at Faulkner’s Ranch or Benjamin Ranch? 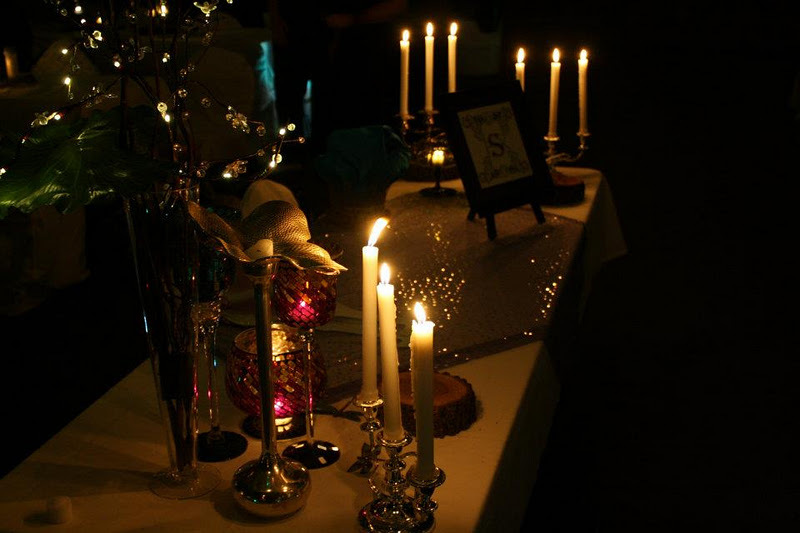 Visit our wedding page for more details! We love when our brides and grooms choose to go a casual, fun route with their rehearsal dinners and lunches. After all, since they will be in suits and dresses the next day, why not have a little bit of fun at the rehearsal dinner? That is exactly what the Lynch Wedding did when they had their rehearsal dinner at Faulkner’s Ranch! That’s right! They had a a dunk tank! And who would that be getting ready to dunk the groom? The fun didn’t stop there though. After serving some delicious BBQ, the bride and groom handed out some super neat gifts to their wedding party. The Soon-To-Be-Mrs. sewed these aprons herself and delivered them in these adorable insulate lunch bags made by Thirty One Bags. Talk about getting the party started! 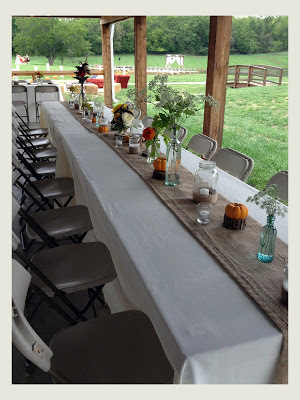 Want to make sure that your rehearsal dinner is just as fun as this one? Just follow these three steps! 1. Don’t be afraid to have fun! Keep in mind that a lot of people might be traveling in or taking a mini-vacation for your big day. So why not treat them to something awesome? Activities like dunk tanks, mechanical bulls, and games are a great way to add some fun memories to your rehearsal dinner. 2. 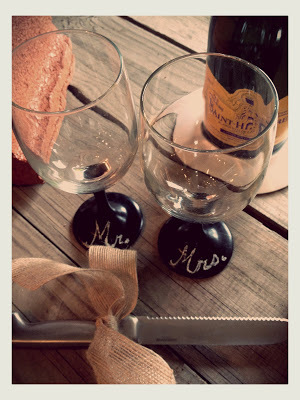 When it comes to giving your bridal party gifts, it is the thought that truly counts! That’s why we loved the aprons – they are so personal! Another great gift idea is to give your party jewelry to wear on the big day. Something that they can use and show off always makes for a wonderful present. 3. Give Yourself a Break! You’ve been planning everything leading up to your big day and often times, by this point, brides and grooms can be pretty exhausted and stressed out. So take a break and relax!! After all, this is celebrating you! Take a note from the couple above – even the bride was in the dunk tank! 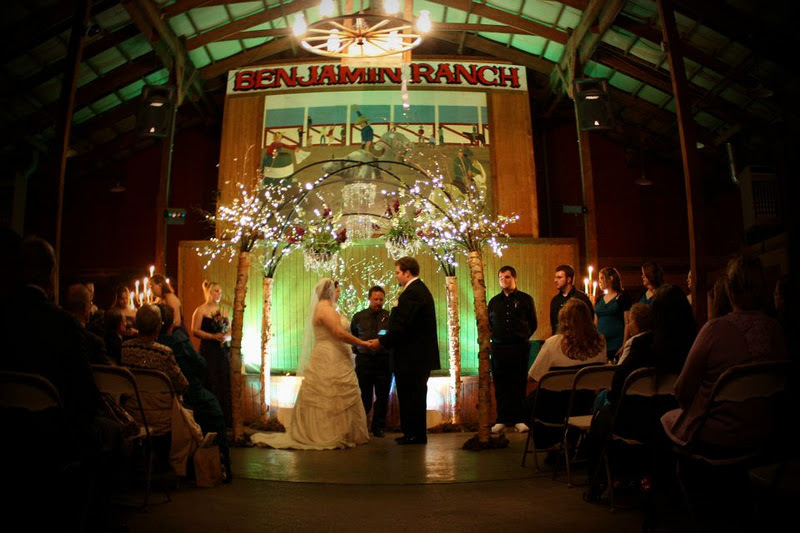 Are you interested in having your wedding or rehearsal dinner at Faulkner’s Ranch or Benjamin Ranch? Just give us a call at (816) 761-5055 and we’ll make it happen! 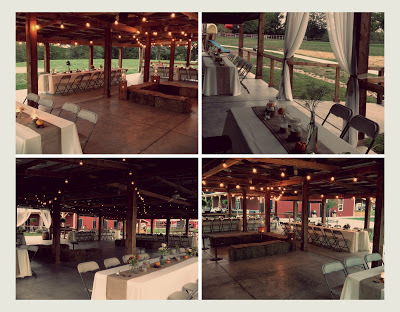 Or just stop on by our Barn Warming Wedding Open House on June 12th from 6-8pm. Oh, and check back next week to see another awesome wedding! It was absolutely beautiful! Trust us, you won’t want to miss it! 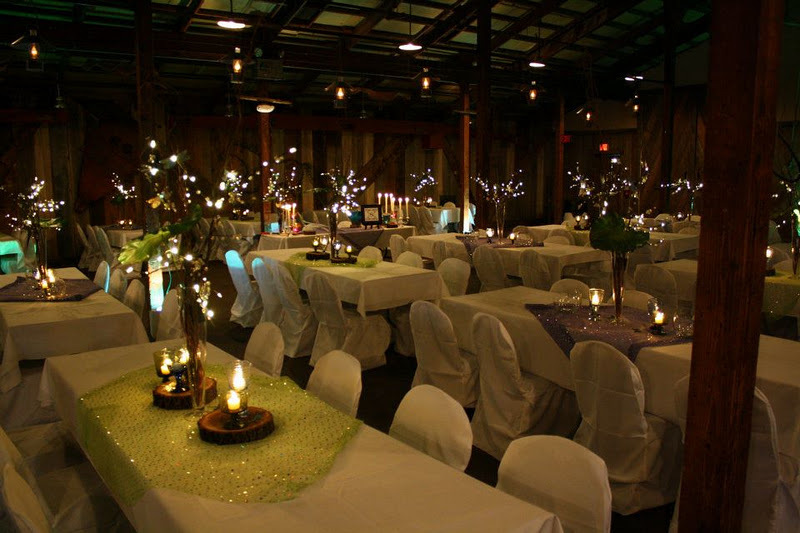 Planning a wedding isn’t necessarily an easy task. That’s why when you have a wedding at Faulkner’s Ranch or Benjamin Ranch we do everything we can to make sure that your planning goes as smooth as possible. our Five Favorite Wedding Planning Resources. Why We Love It: This website literally tools for everything you need to plan your wedding and keep it organized. In addition to the thousands of inspiration photos, there is an awesome timeline to keep you on track, as well as great reviews of vendors in your city. 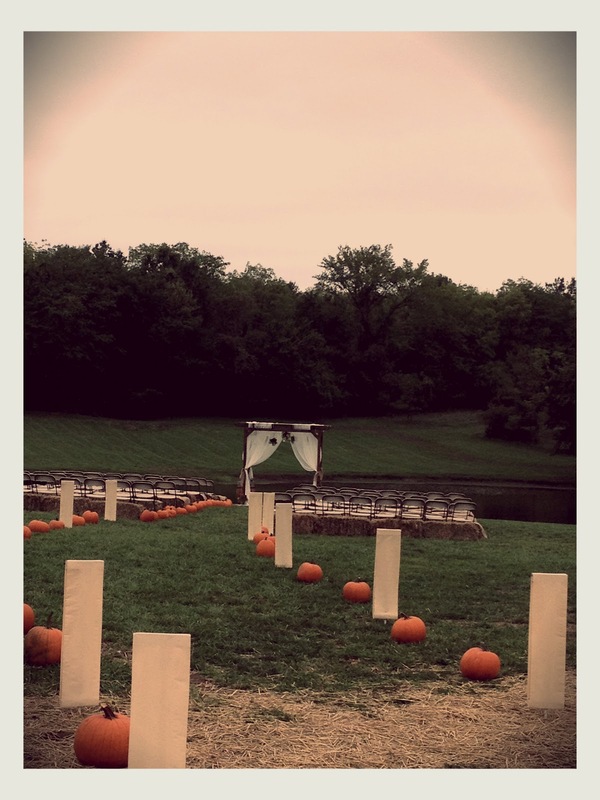 This is definitely a great starting place for any bride-to-be! There is a reason why we do this professionally. 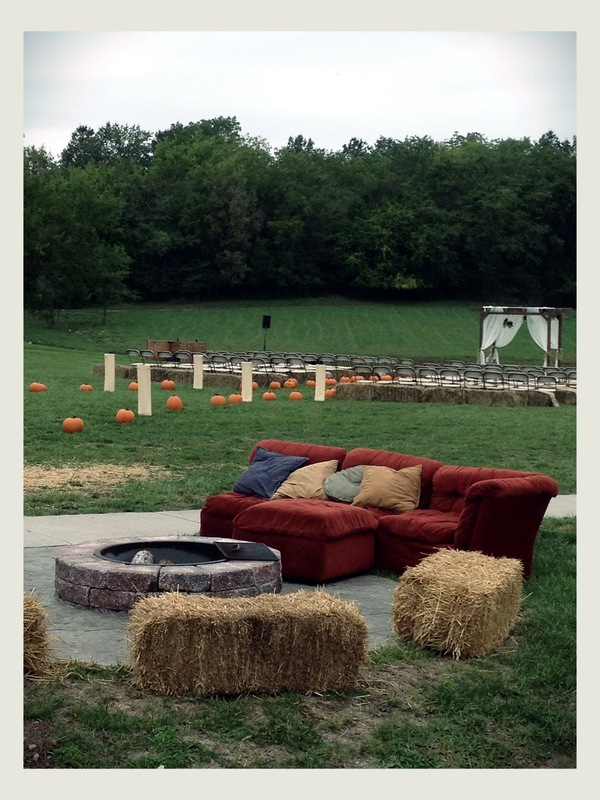 We love putting on top-knotch events. Our event coordinators can point you to the best of the best based for whatever you are looking for. We are connected with the best DJ’s, florists, and entertainers in the business. Just ask and we’ll be able to point you in the right direction! 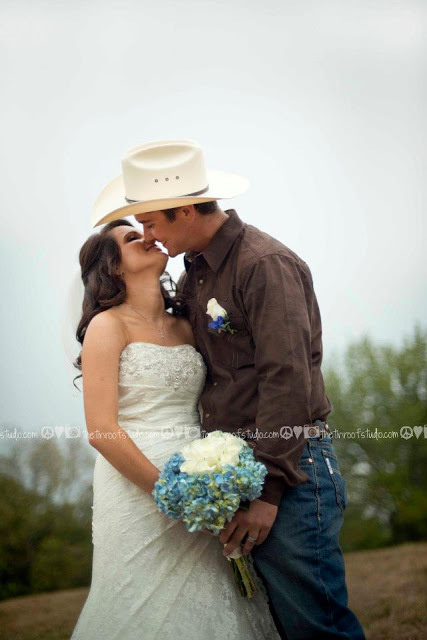 Are you interested in having your wedding at Faulkner’s Ranch or Benjamin Ranch? Just visit our website or give us a call today at (816) 761-1234. 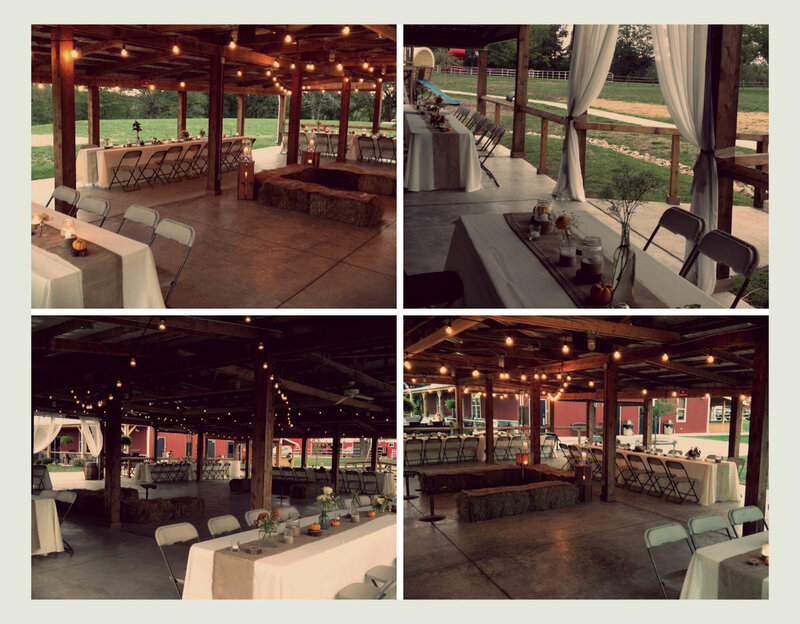 Each Wednesday we’ll be sharing with you tips, tricks, and fantastic ideas for throwing a beautiful and fun wedding at Faulkner’s Ranch! To kick things off, let’s start by answering the big question that every newly engaged bride-to-be has. At this point in your wedding planning, it can be a tad bit overwhelming. However, by doing the three things listed below right away we’ll be able to help you get on the right track to making your dream day a reality. Yes, there are a ton of details to figure out, but first you need to get an overall picture of what you’d like. When you envision the look and feel of your wedding, what do you see? Rustic? Shabby Chic? Country Western? Modern? Elegant? Casual? Remember, you want your wedding to be reflective of your and your future husband’s personal style. 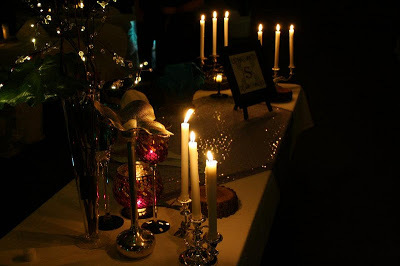 So take some time to sit down together and write down what different things you would each like to have in your wedding from decor to food to attire. 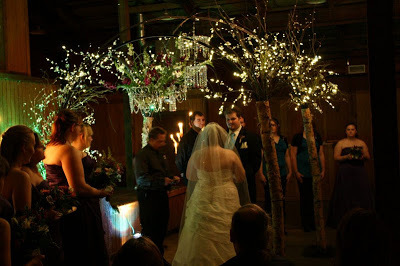 There are no hard and fast rules about what you can and can’t have in your wedding so be sure to include what you want. After all, it is a day to celebrate the commitment between you two so it should reflect that love! This is vital to every decision that will be made in the time to come. Determine how much you would like/will be able to spend and how much of that amount you want to go to each aspect of your wedding. 2. How many guests are you planning on inviting? Make that guest list ASAP. You’ll need to know this when you book your venue, decide on your menu, order your invites, etc. Also keep in mind that this number may have to be adjusted according to your answer in #1. 3. How many members would you like in your wedding party? Figure out how many bridesmaids, groomsmen, flower girls, etc. you will have next to you on the big day. 4. What are three possible dates that you would like to get married on? Look at your calendar and pick at least three possible dates that would work. By having more than one date available when you contact your venue will ensure that you get a date in the books earlier on. 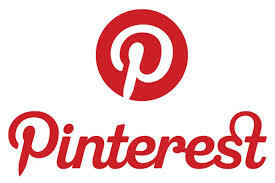 Brides-To-Be, Pinterest is going to be your best friend! Start by typing in your theme and seeing what comes up. Then go from there and have a blast! Begin saving images that you like and perhaps consider starting a wedding binder. All of these images will come in handy when you meet with vendors, go dress shopping, etc. So there you have it – the three things that you need to begin doing to start the process of planning your dream wedding! Trust us, if you get these things done in the beginning it will make the rest of the planning a breeze! 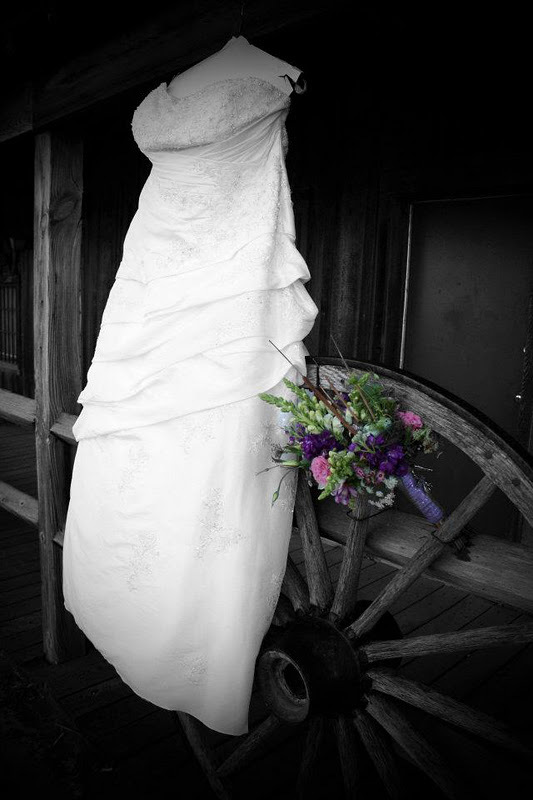 Of course, if you have any questions about having a wedding at Faulkner’s Ranch or Benjamin Ranch please give us a call at 816-761-1234 or visit the wedding section of our website. 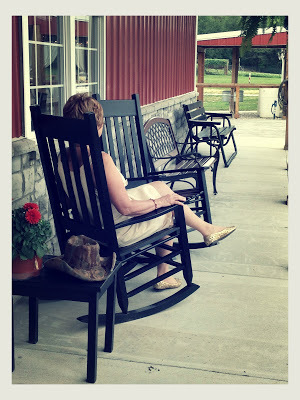 And stay tuned for some news on our brand new Outdoor Country Wedding Party Package! A couple of weeks ago we had yet another amazing wedding at the ranch when we had the privilege to work with Hannah and Issac Cole on their special day. These two lovebirds were just awesome to work with! They were big kids at heart and totally made for one another, which of course makes our job really fun! We were thrilled when we found out that they wanted to have a rustic, fall, pumpkin themed wedding. In order to make their dream wedding come true, they brought in the experts at Blue Bouquet, one of Kansas City’s premier florists. 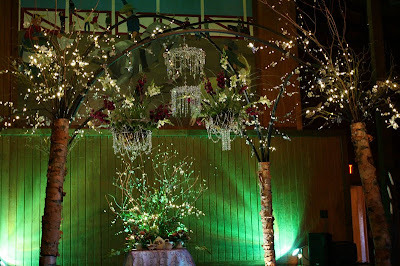 Check out the awesome look this professional team created to make this couple’s vision come to life! They then carried the pumpkin/fall/rustic theme into the ceremony decor with the centerpieces. 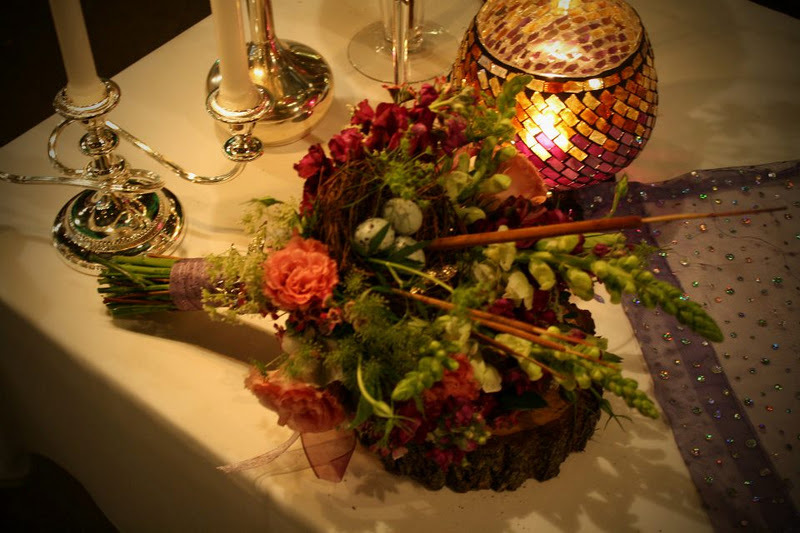 We loved how they used a variety of different types of flowers and vases, along with mini-pumpkins to achieve this look. 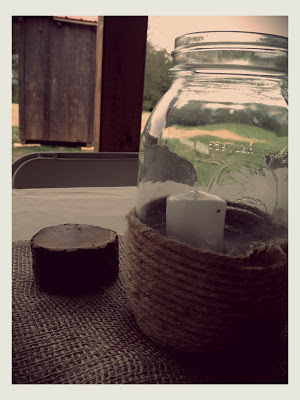 Plus, check out these awesome mason jars that they used as candle holders. We have seen burlap around the base of a mason jar but they used jute which was so cute! 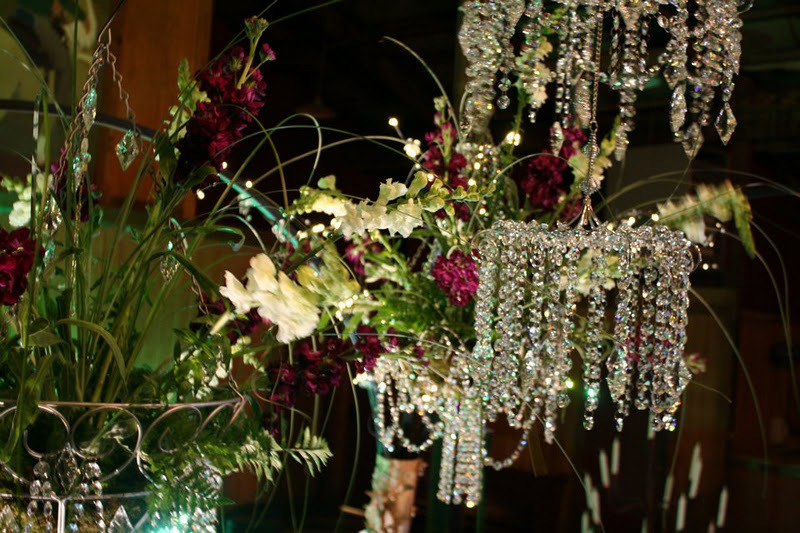 One of the benefits of hiring a florist to set up your wedding is that you get to r-e-l-a-x! That’s why we love the picture below of the mother of the bride just chilling in a rocking chair before the guests arrived. Because she hired a professional like Blue Bouquet, all of the details were seen to, leaving her to relax and enjoy watching her daughter take pictures before the wedding. Now, back to the decor! 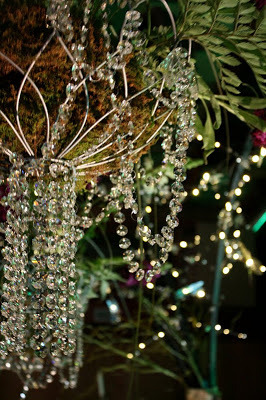 One thing that made this wedding unique was that this couple had a lot of very personal elements worked into their design. One special element included the use of the family sofa that they lovingly referred to as “the pit.” The Mother of the Bride told us all about how the sofa has been in their family for 30 years and how she even has pictures of her oldest son in diapers on it. The close friends of the bride were even telling us about how many movies they have watched on “the pit: and how many nights they have slept on it (as well as a couple of make out sessions in their teenage years, lol). So it was a natural that it spent its last night at Hannah’s wedding, placed perfectly next to the ambient fires for people to lounge on and reminisce. What truly set the pavilion off though was the lighting. 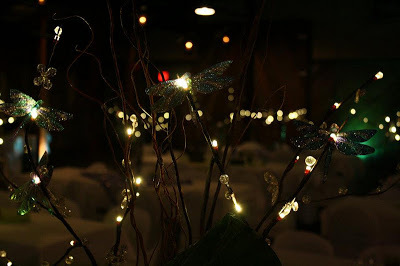 The Blue Bouquet floral crew hand-screwed in hundreds of very fragile bulbs and then hand unscrewed them too at the end of the night. 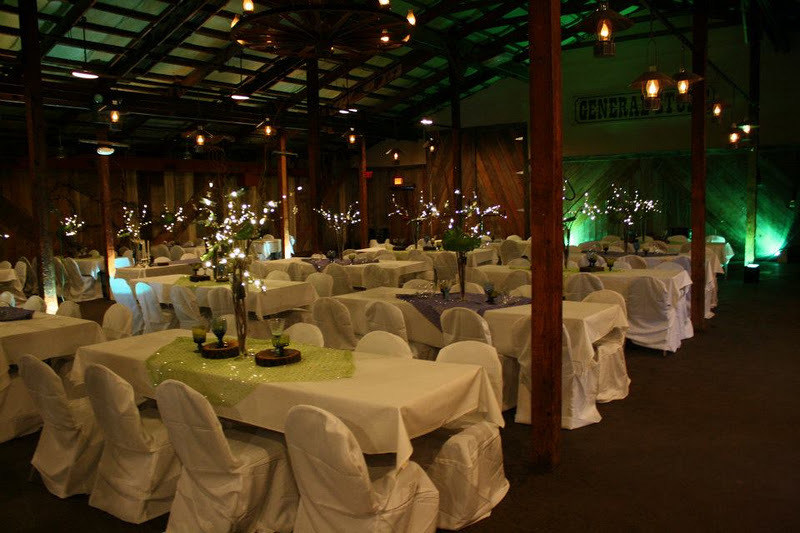 In all they had 5 staff here from 12:30pm to 4:30pm decorating the banquet barn, pavilion, and wedding arbor. 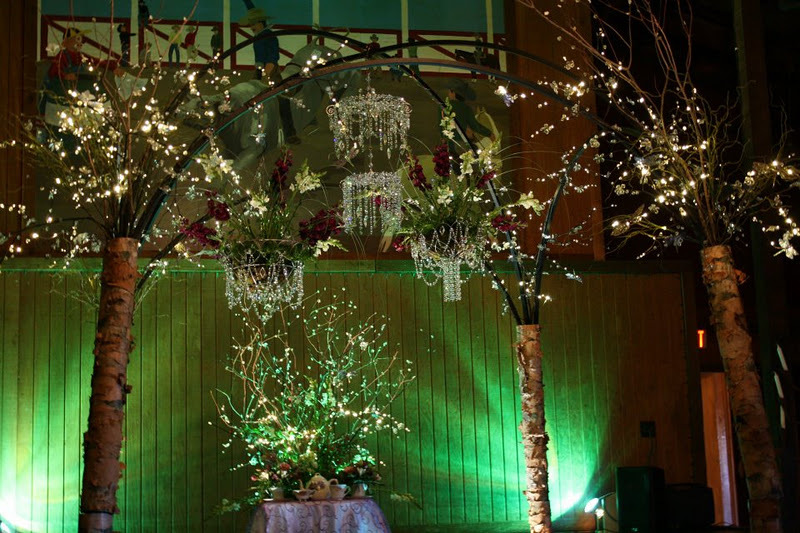 We estimate that they put about 30 man-hours into on-site decor and tear down. Who knows how many they had in preparation? And boy did it show! 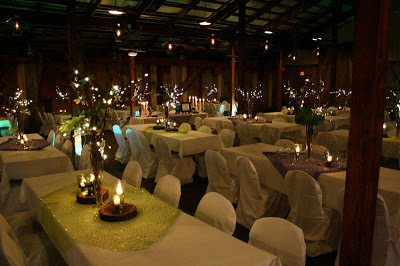 The banquet barn continued their theme and further illustrated how these two were just kids at heart. Oh, and did we mention that the groom even wore a superman boutonniere. Each guest made a thumbprint to look like a balloon and their name or signature to look like the string. They will display this in their home. 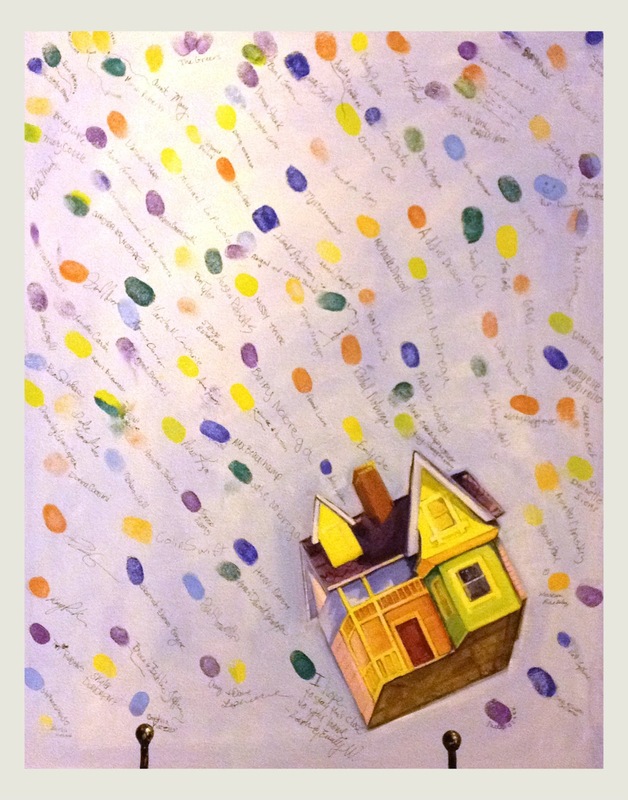 What a fantastic piece of art to walk by each day and remind you of how special your wedding was! Another cool thing that the couple did in lieu of party favors was that they donated to their special friend Charles’s surgery. Charles lives in Uganda and you can read from the picture below his story about being hit by a car at age four. 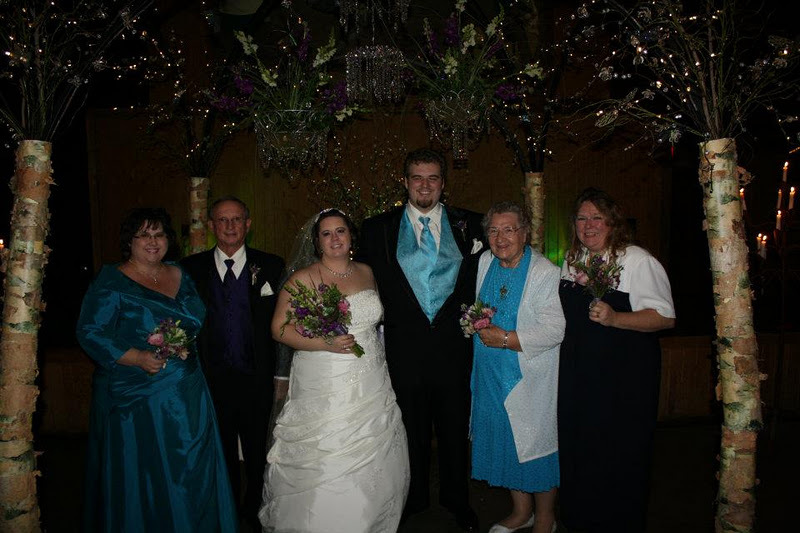 They also Skyped in a relative in Uganda during the ceremony and reception which was fun. Overall, this wedding was such a joy to be a part of! So unique and personal, and of course, we LOVED how they incorporated pumpkins into their design! 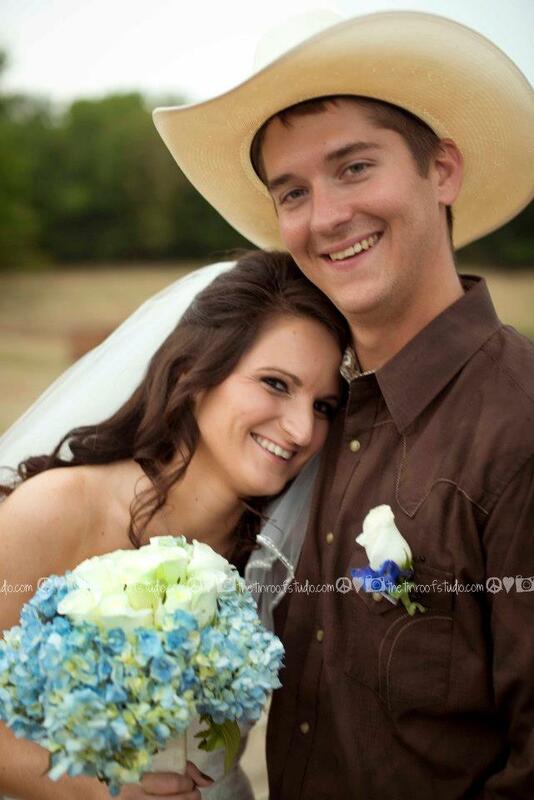 Thank you Hannah and Issac for choosing Faulkner’s Ranch as the place for your special day! 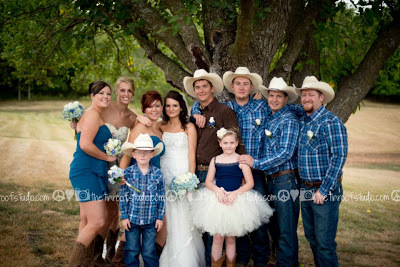 If you’re interested in having your wedding at Faulkner’s Ranch click here for more information! We’d love to show you around and tell you about all that we have to offer! 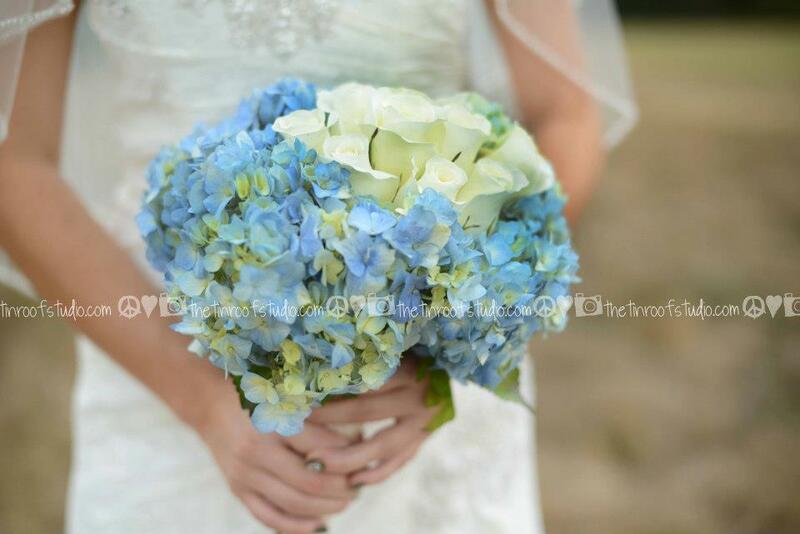 Also, be sure to check out Blue Bouquet if you are looking for a phenomenal florist! 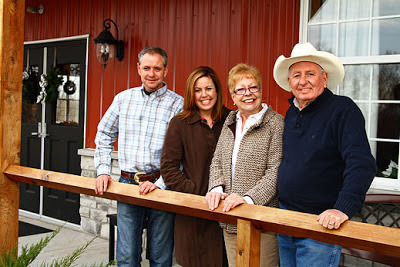 They were an absolute pleasure to work with and we can’t wait to have them back out at the ranch again. We just love having weddings here at the Ranch and on August 18th we were lucky to be a part of one of the sweetest and most Pinteresty weddings that we have had at the ranch to date. 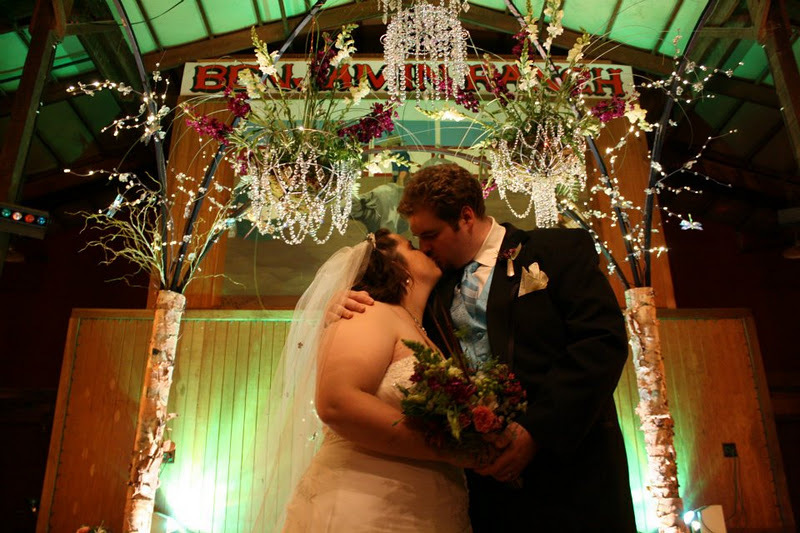 Kelly & Anthony Ammerman were our perfect country bride and groom! Everyone had such a wonderful time that day. The ceremony was beautiful. Even the deer came out to make an appearance leaving the groomsmen were all wishing that they could hunt that day ;o). Lots of dancing and lots of country music! 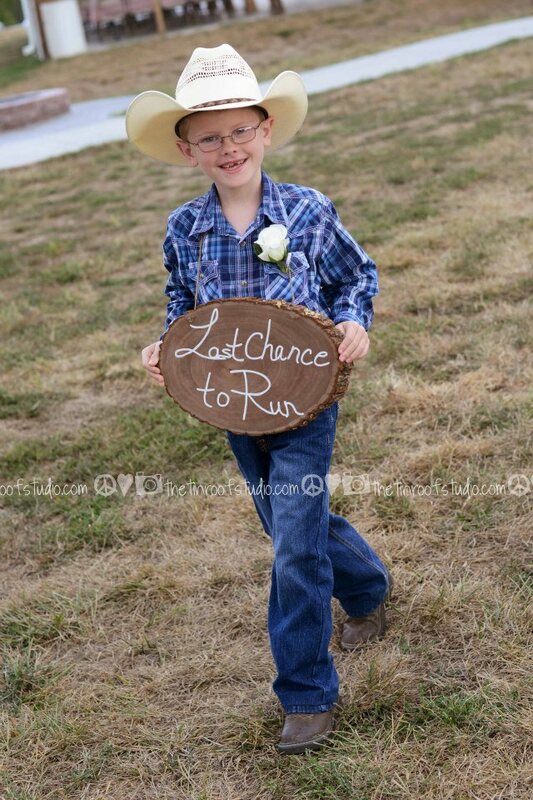 Thank you to Jessica at Tin Roof Studio for sharing these beautiful pictures with us! And thank you Mr. and Mrs. Ammerman for having your special day at Faulkner’s! Here’s wishing you the best! 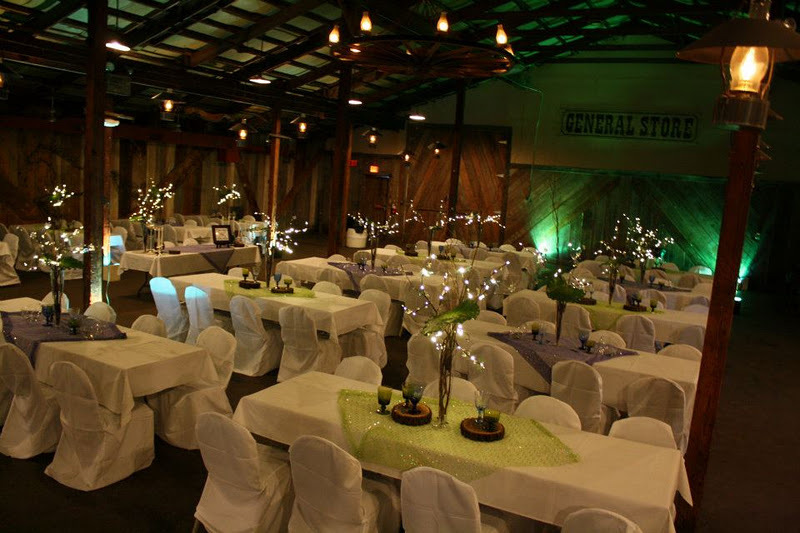 PS – Are you interested in having your wedding at Faulkner’s Ranch? 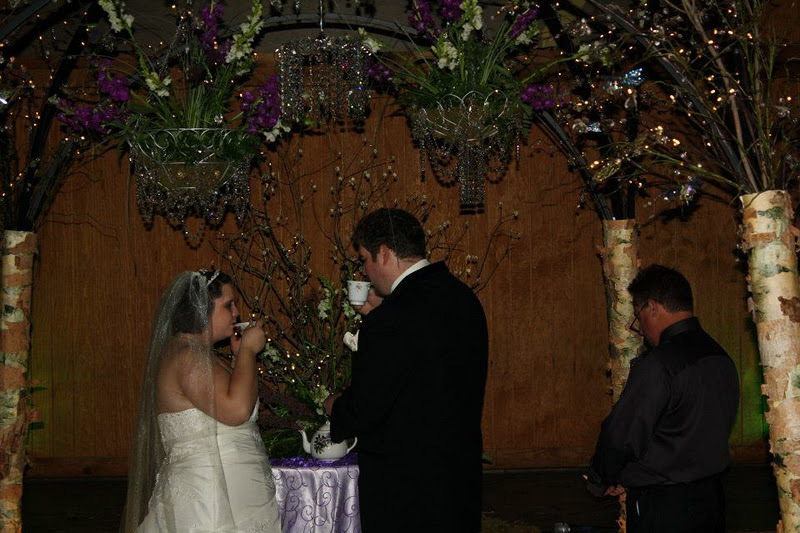 Then just click here for more information on how we can help make your big day everything you dreamed! 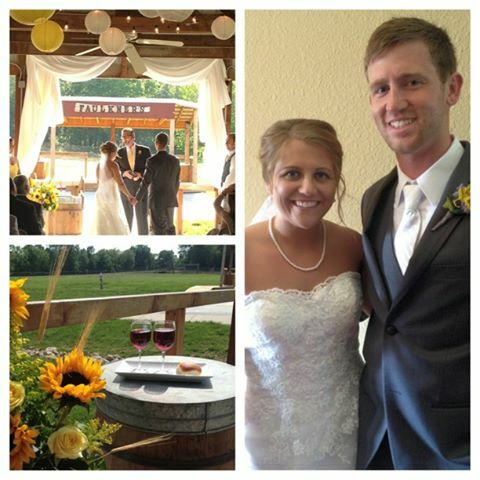 This past weekend was a busy one for the Faulkner’s. To learn more about having a wedding at Faulkner’s Ranch or Benjamin Ranch click HERE.